Posted by Jonathan Bird on Wednesday, March 18, 2015. 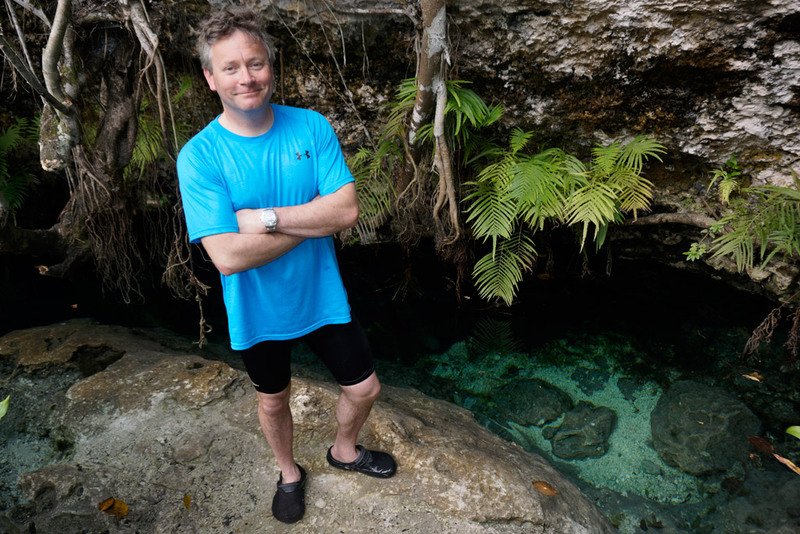 Over the past few seasons of Blue World production, we have done several segments in cenotes and cave-like environments in Mexico and the Bahamas. It first, I didn't have much interest in this kind of stuff. After all, I'm a marine life guy. I would much rather play with sharks than crawl through a shipwreck or film stalactites. On the other hand, the more I saw of the amazing underground world in caves, the more fascinated I became. A couple years ago I started thinking it was about time to get cave certified so I would be able to venture further into the most beautiful parts of the caves. 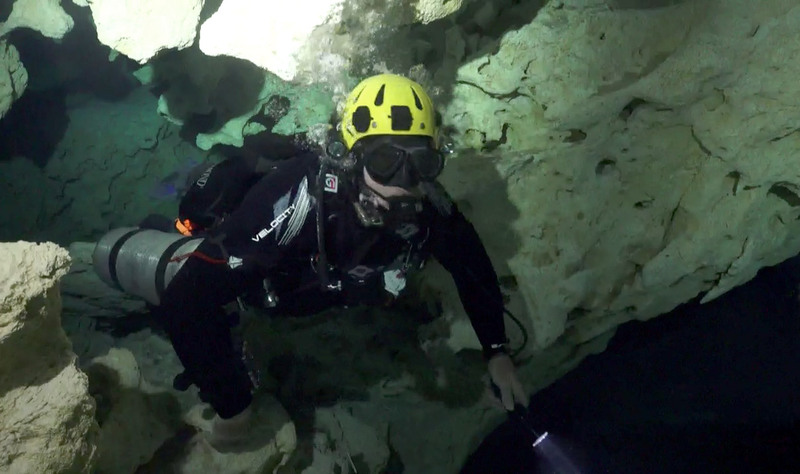 Cave diving is considered an extreme sport because of the obvious danger of being in a place where there is no light, no air, and no way to get to the surface for air in an emergency. In the scuba diving world, if you are in a cave yet you can still see the light from the opening, or if the cave is only half full of water so you can surface and breathe, you are not technically cave diving, but cavern diving. Most of the segments we have done on Blue World where we are filming in a cave, were technically, by scuba standards, caverns, not full caves. (This fine distinction is sort of lost on the general public, so we don't generally get into that level of detail in a Blue World episode). Furthermore, being the host of a TV show does have advantages--when our team shows up to film, we always have lots of local experts helping us out. Whenever we are filming in a fragile cave-like environment, we have a cave instructor with us who serves as our guide. Not only does he or she make sure we get the shots we need, but also makes sure we get back out! 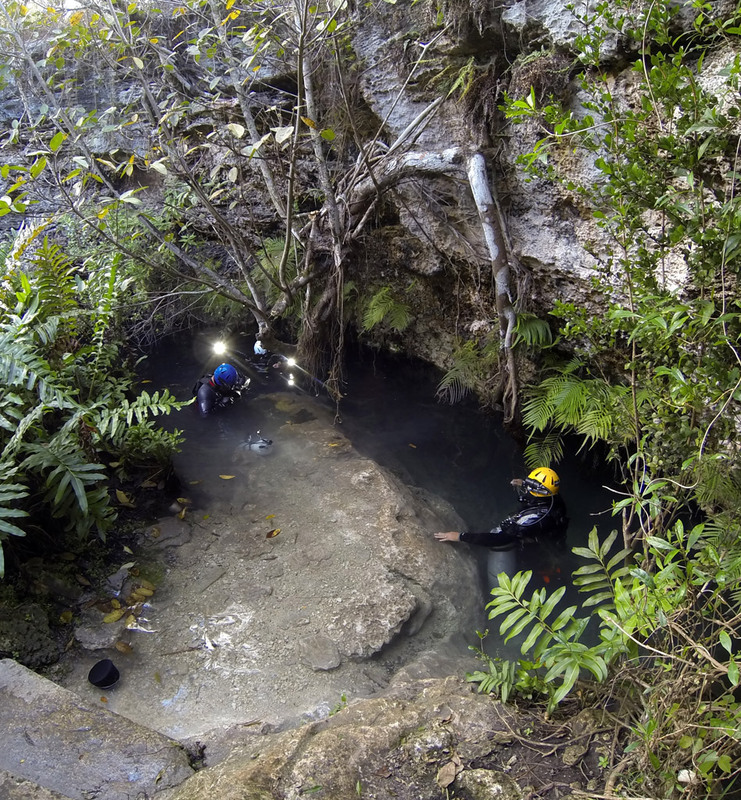 In my travels though, I have heard about awesome caves here and there, mostly in the Bahamas, but also in the Yucatan, that require full cave certification. No way you are going to convince some cave instructor to take you in there without a cave certification. So it really was time for me to get that certification. 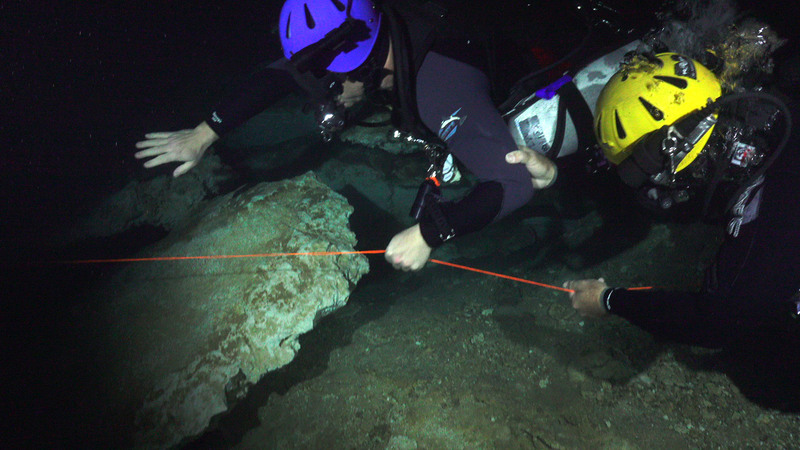 Full cave certification is sort of like the black belt of scuba diving. It's among the most difficult and intense training a scuba diver will ever undertake. And there is a reason why--the consequences of an accident can be fatal. But surprisingly, the sport is statistically pretty safe, especially for trained cave divers who are smart enough to follow the rules. I wanted to be one of those divers. I also wanted to be trained by the best. 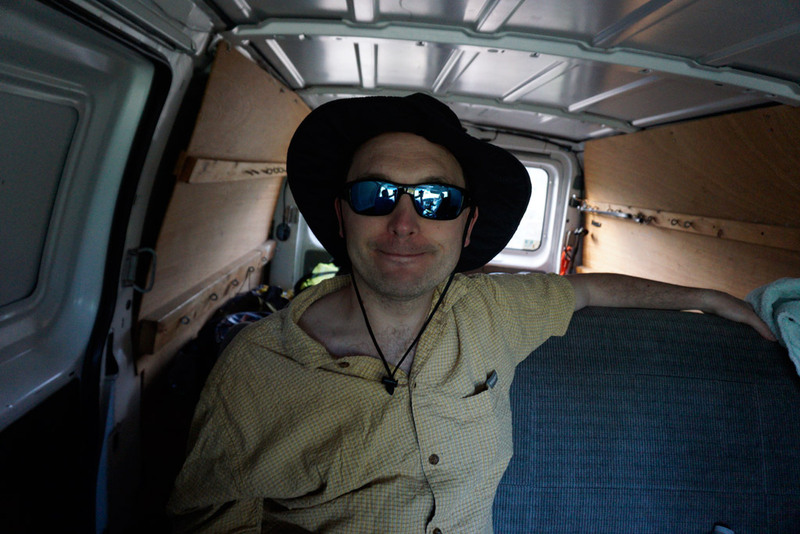 His name is Brian Kakuk of Bahamas Underground and he is a world-renown American cave explorer living on the island of Abaco in the Bahamas. It's no coincidence that Brian lives in Abaco. Abaco is home to what is probably the world's most exquisite cave system. Brian's mission is to protect this cave system. 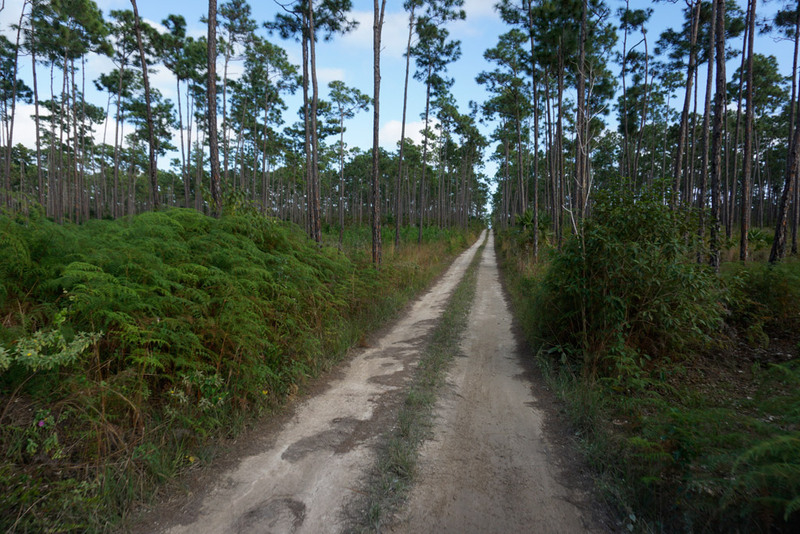 He is in the process of working with the Bahamian government to get the whole system protected as a national park. 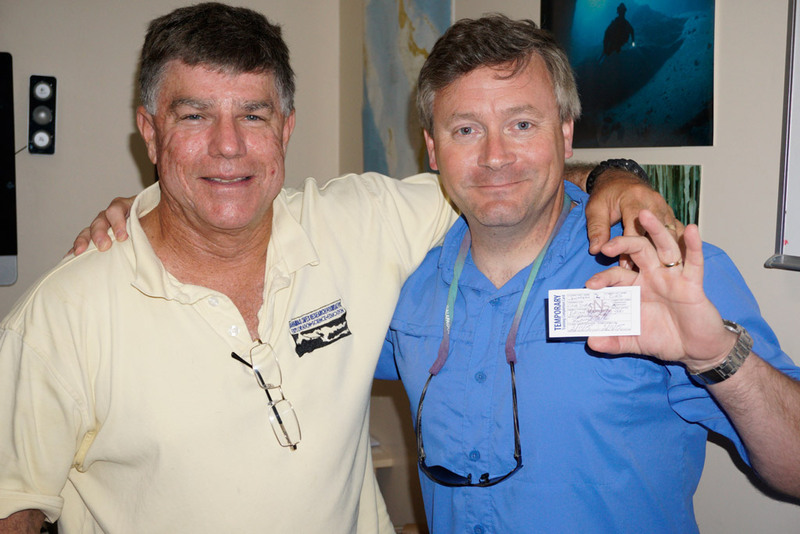 Throughout Brian's career he has been a Navy diver, cave explorer, technical dive supervisor, and dive safety coordinator on dozens of films, including a few you may have seen, like all the Pirates of the Caribbean Hollywood films. Yes, he knows Johnny Depp. I asked Brian if he would train me as a cave diver, and allow us to film it as a Blue World segment. He was game. But not only would I need to learn cave diving, I would also need to learn a special kind of diving called sidemount. 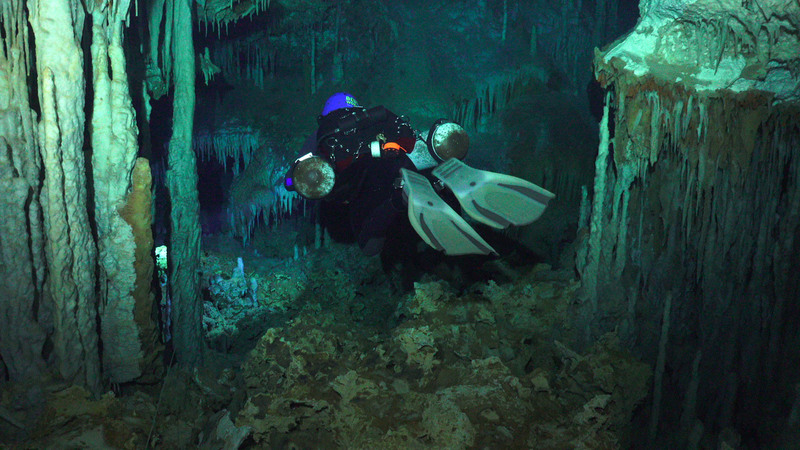 Conventional cave divers wear double tanks on their backs. The double tanks are for air supply redundancy--a requirement of cave diving. But when you wear them on your back, you can't fit into small openings (called restrictions) in the cave. Because the caves where Brian teaches have so many restrictions that are not backmount friendly, he only teaches in sidemount. Sidemount is when you wear your tanks on your sides, just under your arms. As you swim along horizontally in the water, the tanks float along beside you. It sounds weird, but it's actually really comfortable, and much easier to use in the water than backmount tanks. Brian invited me to take his "Zero to Hero" class which actually consists of 4 classes in one. You start out a Zero on the first day (open water certified). You progress through cavern certified, Introduction to Cave certified, Apprentice Cave, then finally Full Cave. This training would take 8 days minimum. (In my case, because we also had to add in some sidemount training, it ended up being 9 days.) Because cameraman Todd is already Cave certified, he came along as the cameraman on this shoot. 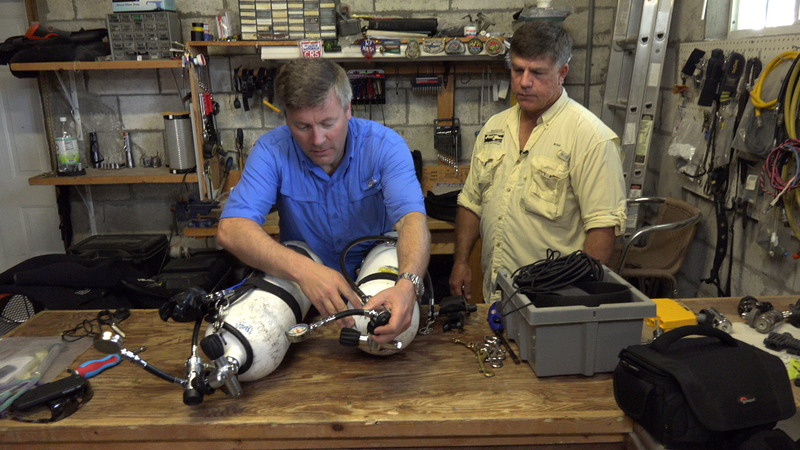 But just like me, Todd had never dove sidemount configuration, so he had some training to do as well. Since Todd and I would be busy working in the water (me training and Todd filming) we also brought along Pierre as our topside cameraman. I was so glad to see Pierre again. He hasn't been on a shoot for a couple years and it was fantastic to have him there with his great eye for composition making sure we had the shots to tell the story. And what a story! For 9 days Brian was my Jedi Master of Cave! We started each day in his office/classroom with his dog Otis sitting on the couch listening intently to the lectures with me. Then we would head out to his shop and configure some gear. There was usually an exercise each day outside in the yard. Usually involving me, blindfolded, trying to navigate using a guideline, or learning to tie line tie-offs in simulated darkness. Later in the day we ended up either at an old quarry where we were doing some open water training, or at Dan's Cave where we did cave training. These were long days, 12 hours. And Brian didn't take it easy on me because I'm such a nice guy. No, if I wanted to graduate, I would need to be able to do everything, in the dark, with my air supply compromised, and my buddy out of air. I never knew when he would swim up and tell me he was out of air, then make the hand signal to shut off all lights and lead him out of the cave in the dark, navigating by guideline. We practiced clearing flooded masks upside-down. We practiced navigation in the pitch darkness. We practiced breathing off a free-flowing regulator while feathering the tank valve to preserve the volume of air in the tank. By the end of the training, pretty much nothing bothered me. I had become extremely self-sufficient and easily the best diver I have ever been. I passed my 4 hour written final exam, and Brian declared me a cave diver. It was exciting and rewarding! And fun! But the adventure wasn't over. Because now, you see, as a trained cave diver, Brian allowed me to take my camera into the cave. (Can you imagine me diving for a week with no camera? Good grief!) We started in the larger, easier sections of Dan's Cave, where we did some great filming with Brian backlighting the formations to make them pop. We didn't have time for this kind of photography during the training. Mostly, Todd was just following us around filming all the crazy training exercises Brian was doing with me. But now, we could get more creative, light things better, and focus on what makes these beautiful caves so special. Once Brian was satisfied that I could handle my big Gates housing in the cave and the camera wasn't messing with my buoyancy, he agreed to let us film the Holy Grail of Caves: Ralph's Cave! (Now, I know what you are thinking! Ralph's Cave--that doesn't sound very exciting. I have to agree, it needs a better name. Like Crystal Cave, or The Most Amazing Cave in the World, or something like that.) Anyway, this cave is full of the most delicate crystal formations I have ever seen. Brian describes it as swimming into a chandelier, and that about sums it up. My ultimate goal was to film the insanely beautiful and fragile Glass Factory room where we would see formations that Brian calls "Frozen Rain." We went first with no cameras to get a feel for the place. The next day we went back with the cameras. And I'm proud to say we didn't break a thing. We just got home from the shoot and I had a quick look at the UHD (4K) footage on our 4K editing system, and man, is it beautiful. We have a ton of work ahead of us to edit this segment. There is a LOT of footage (almost 1 terabyte) to go through. But this will be a simply stunning segment! 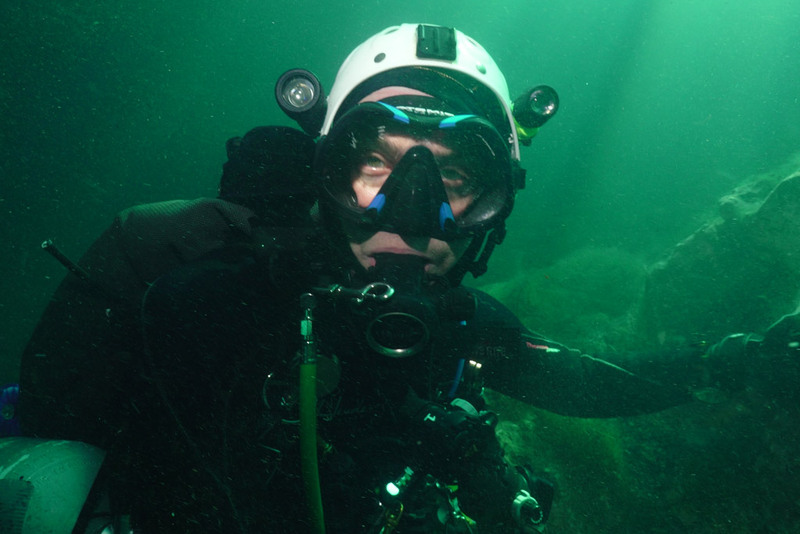 Thank you Brian for turning me into a real cave diver! 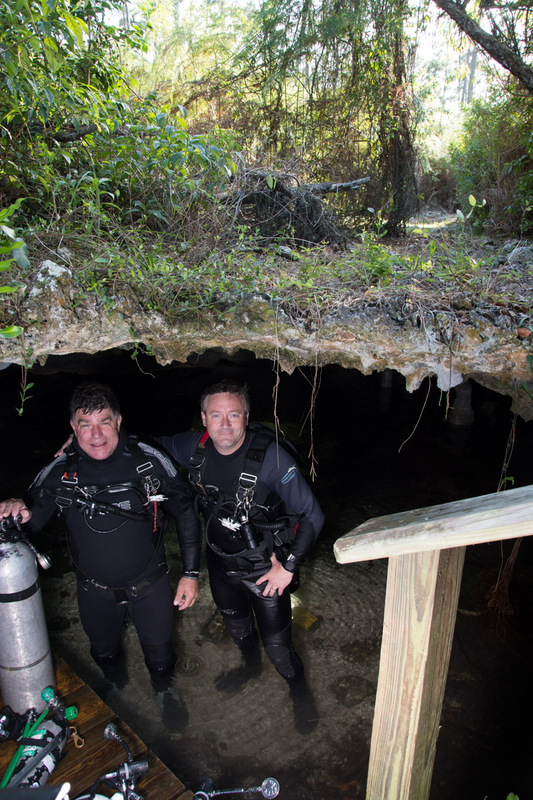 Photo Gallery: Cave Diving in Abaco!